Looking for recommended lenses for Nikon D3300 entry-level DSLR? Take a look at our best lenses for Nikon D3300 camera. The Nikon D3300 is the first entry-level product enabled with SnapBridge connectivity. It has a 24.2-megapixel APS-C sensor without an anti-aliasing filter. If you are a new user or in touch for this digital SLR camera. You have only need to find the right or the best lenses for Nikon D3300. We have covered all lenses from Nikon and other companies and selected the best choices based on good price, usefulness and high image quality. Below are the top recommended and best Nikon lenses that are excellent for both complete amateurs and highly advanced photographers. You can choose the one you need for D3300. Nikon 18-300mm f/3.5-6.3G ED VR ($697): Outstanding all-in-one telephoto zoom! It would be the best choice if you want to pick only one lens for Nikon D3300. Surprisingly compact and lightweight for a 16.7x zoom lens, the Nikon 18-300mm f/3.5-6.3G ED VR draws great performance for Nikon DX-format DSLRs. You can shoot just about anything from stills, videos, landscapes, interiors, portraits to wildlife with this lens. 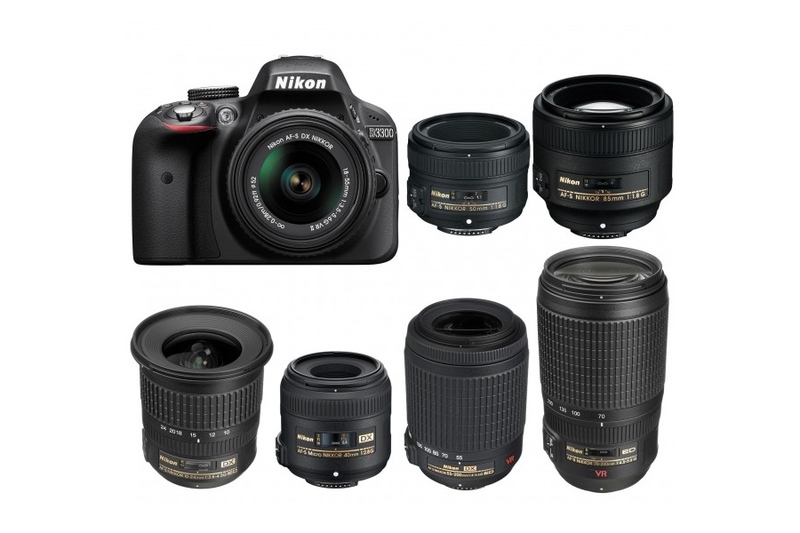 Nikon 18-200mm f/3.5-5.6G ED VR II ($647): The Nikon 18-200mm f/3.5-5.6 is an extremely popular all-purpose lens. The travel zoom optic features excellent sharpness at tele and wide end and it is fully compatible with DX cameras. Nikon 35mm f/1.8G ($167): Budget option! The Nikon 35mm f/1.8G AF-S DX is small, optically great and also the most affordable Nikon lens out there. With an f/1.8 maximum aperture it is useful in low-light conditions and it has one aspherical element to help control distortion and aberrations. A perfect lens and great for wedding, portrait, casual, low light, indoor photographers. Nikon 50mm f/1.4G ($216): Highly recommended! An ideal portrait lens when used on a Nikon DX-format digital SLR. It is perfect for travel, event, environmental and general photography in a wide variety of conditions, with superb optical formula. It’s just like the 35mm above, and also features the same aperture size. Due to a slightly longer focal length, its bokeh (background blur) looks more pleasing. Nikon 85mm f/1.8G ($477): The third lens would be a good investment for both DX and FX. The Nikon 85mm f/1.8G AF-S is perfect for weddings, portraits, street and concert photography. Nikon 40mm f/2.8G Micro ($277): Ideal for shooting close-up photography. The 40mm focal length is great for product, bug, portrait and even casual photography. This Nikon 40mm f/2.8G Micro allow users to get true 1:1 magnification for extremely close-up imaging. It’s designed for DX cameras which the D3300 is, so AF and image quality are top notch. Nikon 60mm f/2.8G ED Micro ($596): Amazing Macro Lens! As you know Nikon calls their macro lenses ‘micro’. This medium telephoto Micro lens is ideal for extreme close-up. It is also FX compatible and considering the price it would fit for future camera upgrades. When used on cameras with an APS-C size sensor, the equivalent focal length is 90mm. Sigma 20mm f/1.4 DG HSM Art ($899): Excellent lens – great for seascape, cityscape, and astrophotography, as well as for photos in low light, indoor photography, portraits, and event and wedding photography. Nikon 10-24mm f/3.5-4.5G ED ($897): Highly recommended! Nikon 10-24mm f/3.5-4.5G is probably the best DX format wide-angle lens. Tokina 11-16mm F/2.8 ATX Pro DX II ($499): Budget-lens with great image quality. The Tokina AT-X 11-16mm f/2.8 PRO DX II ultra wide-angle zoom has a bright constant F2.8 aperture make viewing and auto focus possible in lower light situations. This would be the best option for new D3300 users who are interested in landscape photography. Sigma 18-35mm f/1.8 DC HSM Art ($799): Highly recommended lens to buy for Nikon D3300. The Sigma 18-35mm 1.8 DC HSM Art lens is a new benchmark in photographic history. It is the first wide-angle to standard zoom lens to achieve a large aperture of 1.8. The Sigma 18-35mm f/1.8 Art is ideal for landscapes, portraits, still life, snap shots, casual, and close-up photography. Sigma 17-70mm F2.8-4 DC Macro OS HSM ($499): Budget option! The second version of Sigma 17-70mm f/2.8-4 DC OS HSM boasts superior peripheral brightness and provides sharp, high contrast images even at the maximum apertures. If you need to be ready for any photographic opportunity, even low light, then this Sigma lens is perfect. Nikon 18-35mm f/3.5-4.5G ED ($747): An excellent travel and all-purpose lens! This lens features a compact, lightweight design making it a highly portable lens that is ideal for travel. Nikon 70-300mm f/4.5-5.6G ED-IF VR ($497): Budget option! Ideal for wildlife, travel, well-lit sports and general photography. It offers a 4.3x zoom with a focal length range 35mm equivalency of 105-450mm when used on DX-format DSLRs. It also provides the equivalence of 2.5 shutter speed stops to help in capturing sharper images in low light or at extended zoom lengths. Nikon 55-200mm f/4-5.6G ED VR II ($147): A versatile and compact telephoto zoom lens that is well-suited for portraiture, sports, or wildlife photography. It has an amazing value and offers good performance with respectable levels of sharpness at many settings. The lens is ideal for travel and everyday use.